The 40th Pic of the Week by the Chronicles takes us back 11 years and to this bridge. The Little Church Road Bridge spanned the Turkey River near the village of Festina in Winneshiek County, Iowa. Built in 1876 by the Wrought Iron Bridge Company of Canton, Ohio, this bridge was once the third longest bowstring arch bridge in the US, behind the Freeport in Decorah and the Kern Bridge in Mankato, with a total length of 178 feet. When this photo was taken, it was at sundown, where the sun had disappeared into the clouds, but the skies got bluer, as well as darker. This pic was taken with frost-covered weeds obscuring the entire structure in view. With those two in mind, it made the bridge look creepy. With cars and trucks crossing it, creating a series of screeching noises caused by friction among the iron parts, it made the bridge look haunted. Even when my wife and I were in our rental car heading to the hotel in Decorah, that sound could be heard hundreds of feet away. Since 2010, the bridge is no more. It was scrapped at the last minute due to failure to secure funding to relocate it to Decorah for use as a bike trail crossing. That decision sparked an outcry by many in the historic bridge community, especially because of its rarity in design and dimensions. In spite of this, the county still has two historic bowstring arch bridges in use, both of which are in parks in Decorah (with the Freeport) and Castalia (with the Moneek), plus a modern one located next to the Freeport in Decorah. It is unknown whether another one, the Gilliecie Bridge, which collapsed under the weight of a truck in 2017, will ever be rebuilt. But in either case, the rare number of these bowstring arch bridges in the county shows how much we should care for our historic structures. If there are chances to save them, we go all the way knowing the consequences in either direction. Anything less than that is the same as taking away the chance of others to visit and photograph the historic bridge, to walk back into history, even for a few minutes. And for that, no book or internet site can replace it, even if one tries to persuade the writer. The next tour guide is a three-part series on one city with several regions where historic and architecturally noteworthy bridges are worth a day’s visit or two. The city is one of Germany’s most prized crown jewels in terms of architecture and culture. It is the second largest city based on population but at the same time, it’s the state’s capital. It literally rose from the ashes of World War II as ariel bombings in 1945 almost completely wiped out the city and nearly its population. It took over a half a century to rebuild the city to its original glory, which includes the Church of our Lady, the Semper Opera and the Residential Palace, just to name a few. It can pride itself on the Christmas markets as it has one of the oldest in the world in the Striezelmarkt. As far as bridges are concerned, almost every type of bridge from every period exist in Dresden and the surrounding area. This includes bridges built in the Baroque period, the Industrial Age, between and after the two World Wars and after the Great Flood of 2002, where half the city plus the suburbs along key tributaries were underwater, the bridges either destroyed or damaged beyond repair. The city is Dresden. Located in the eastern part of the German state of Saxony, the city with 551,000 inhabitants (with the suburbs including Radebeul, Freital, and Heidenau, it’s close to 750,000), is located on the River Elbe. Some smaller rivers flow into the Elbe in Dresden, one of the most important is the Weisseritz, which starts in the Döhlen Becken, a valley where several streams starting in the eastern Ore Mountains (Erzgebirge) merge in Freital to become a main passage to the river. The city has a well-structured infrastructure, where one can bike, drive or ride the train, tram or bus through Dresden without having to worry about accidents and traffic jams. Bike trails run along the Elbe and Weisseritz but connects to several important places including the schools and universities. Train service features regional and long distance trains connecting the city with Prague, Berlin, Leipzig and Nuremberg. Two motorways (4, 17) bypass much of the city with major highways providing much of the service. And the infrastructure is not complete with the bridges that cross the rivers and other ravines, something Dresden can pride itself on. With as many bridges as the city has, it is just as appropriate to divide this tour guide into three series minus the introduction. The first one will start in the mountains along the Red Weisseritz in Rabenau, much of which is along the Tourist Railline between Freital and Kipsdorf. This area has been rebuilt after the Great Flood in 2002, much of which mimicking its original form. Part 2 will look at the Freital area along the united Weisseritz, which will take us down to the city. One of the bridges has already been written and can be seen here. And part 3 will feature the bridges in Dresden City, much of which is located along the River Elbe, but we have some notable outliers. This includes some in the harbor area, a pair of bridges in Pirna, one in Radebeul and one in Meissen. A map of the bridges in Dresden can be found in each part to allow readers to find and visit them. And now, onto Part 1. Enter the Senior Citizens Club Haus Schlossblick in Schwarzenberg and their prized work, Schwarzenberg’s Bridges. The booklet was released in December 2018, with many copies having been sold during the Christmas markets and beyond. Even though the target language in this 53-page booklet is German, the booklet is laden with pictures of Schwarzenberg’s 44 bridges- both past and present- combined with years of research and photo collections all put together and presented in a form of a tour guide. The photos with the bare essential information is enough for people to read up before finding the bridges, especially as they are listed in the order going downstream for every river mentioned, minus the railroad crossings. The booklet is different to another bridge booklet written in 2014 on the city of Aue. (For more, please click here to view the tour guide). While current pics of the city’s bridges were included, there was mainly text on the history of each of the bridges in the city of 16,000, located at the confluence between the Zwickau Mulde and the Schwarzwasser, as well as along the Flyover, connecting the city with the Autobahn 72. More pics on the previous structures, plus a better selection of information would have perhaps helped. Interesting is the fact that the author included the Markersbach Viaduct in the booklet. While that bridge is only a few kilometers away, it was included in the Chronicles’ tour guide (shown here). Still, the authors believe that it belongs to the Schwarzenberg ensemble, which is considered far fetched but ok. Also included is the Hammerbrücke, a covered bridge located in Lauter, which is three kilometers away. A map with the location of the bridges in Schwarzenberg can be found below. I did a bike tour in the region on three different occasions and have therefore included photos in all but a couple of the city’s bridges. The rest of the information is from the booklet. The book on Schwarzenberg’s bridges, which can be bought at the tourist information center upon personal visit for only six Euros, does bring up a question with regards to writing a book on bridges in such a community. While the book with sufficient information and photos on the bridges, like in Schwarzenberg, would be appropriate especially for readers who just want to know a bit on the bridges, the question is whether this book would fit for another community. Which town would benefit from such a “picture book” with sufficient information? Feel free to make your top five cities you would like to see a bridge book written on, either by choosing from the Chronicles’ tour guide page or adding some of your own. Before announcing the official winners of the 2018 Ammann Awards, it’s time to take a look at the winners of the Author’s Choice Awards. Here, the author of the Chronicles (yours truly) picks out the best and worst in terms of bridges. And for this year, there is plenty of fame to go around. So without further ado, let’s take a look at my picks to close off a busy year. Florida International (niversity Bridge in Miami- There are accidents with fatalities that are caused by natural disasters, then we have some caused by human error. The Florida International University Bridge in Miami, which had been built by FIGG Bridge Engineering was one that collapsed on March 15th, killing six people was one that was caused by human error. Faulty design combined with a lack of thorough inspection caused the double decker bridge to collapse in broad daylight, turning a dozen cars passing underneath into steel pancakes. Most of the fatalities were from people who were squished underneath. It was later revealed the FIGG and four other companies had violated seven regulations resulting in fines totalling $89,000. Yet they are not out of the woods just yet, due to lawsuits pending against them. 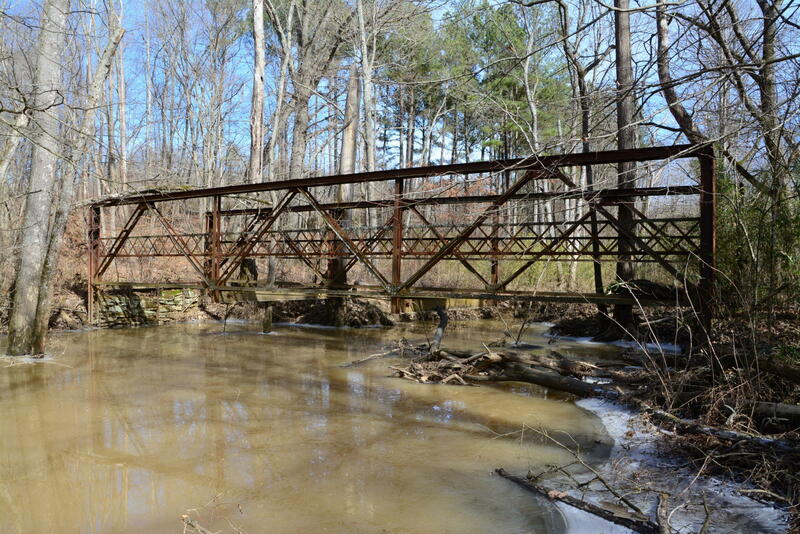 It is unknown whether a new pedestrian bridge will be built. 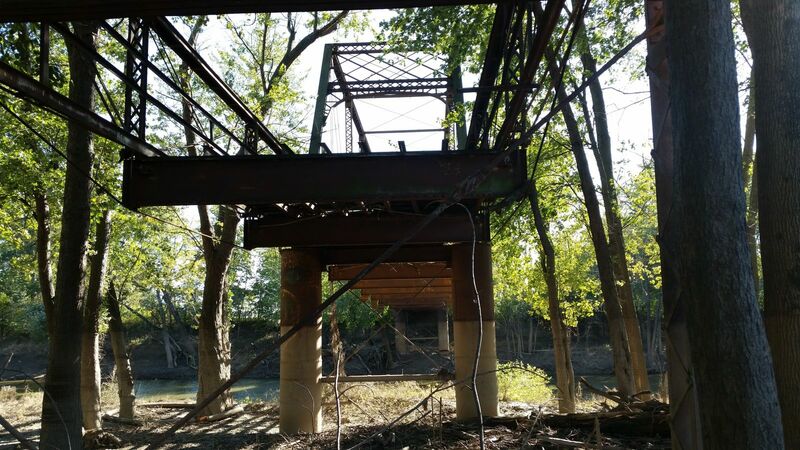 Kingsland Bridge in Texas- We have accidents caused by mother nature that produced no fatalities and not even the most modern of bridges can withstand. A pair of runner-ups come to mind on the American side: The bridges that were lost in the worst forest fire in California history, and this one, the Kingsland Viaduct, a 50-year old bridge spanning Lake Llano that was washed away by floodwaters on October 6th. Fortunately here, no casualties were reported. A new bridge is being built. Morandi Viaduct in Genoa, Italy- It was the collapse of the year. The Morandi Viaduct in Genoa in Italy collapsed on 14 August during a severe storm. 22 people were killed, many of them had been crossing the concrete cable-stayed suspension bridge at the time of the collapse. The work of bridge engineer Ricardo Morandi had been under scrutiny due to defects in the decking and concrete cables and it was a matter of a simple storm to bring part of the bridge down. It served as a wake-up call for the Italian Government as it introduced strict standards for bridges afterwards, also in Europe. Other Morandi bridges are being examined with replacement plans being put together. As for this bridge, the 54-year old structure is currently being replaced with a steel/concrete beam viaduct, which is expected to be finished by 2020. Chiajara Viaduct in Colombia- Runner-up here is another cable-stayed bridge, but located in the forest near Bogota. Here one didn’t need a storm to bring down the partially-built bottle-shaped cable-stayed suspension bridge, which happened on 15 January. 200 people were attending a seminar when the collapse happened, unfortunately those who were on the bridge- about 20 workers- were not so lucky. Eight were killed and others were injured, some critically. The completed half of the bridge was taken down six months later. It is in the process of being rebuilt. 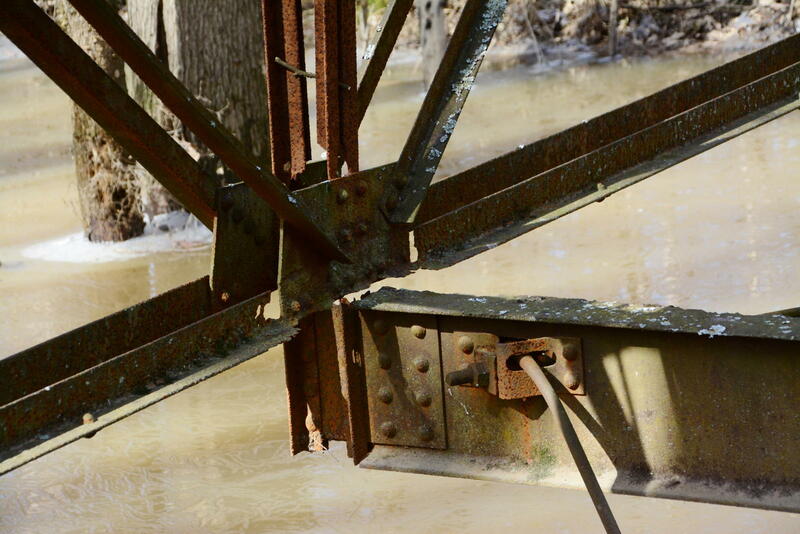 Man Destroys Historic Bridge in Indiana, Gets Sentenced and Asks for a Retrial- This really bonehead story goes back to the now extant Hohmann Railroad Bridge, which used to span the Grand Calumet River near Hammond. The person was arrested and tried on federal charges of not only trespassing onto the bridge, but destroying property for the sake of scrap metal- without even a permit. His claim: no one owns it so the metal was his. He was sentenced to 10 years in prison without parole, yet he just recently asked for a retrial- for treating him unfairly in court and for wrongful judgement! Mr. President (Donald J. Trump): I have the perfect candidate for you to replace Elaine Chao as Head of the US Department of Transportation! He’s that type of guy! Truck Driver Destroys Covered Bridge in East Chicago Days after Its Reopening- If the mother of this driver was at the scene of this rather careless accident, the person would have had a lesson of a lifetime, known as You break it, you fix it! On 28 June, 16 days after it reopened and was designated as a historic structure, Mr. Eriberto Orozco drove his truck through the covered bridge, ignoring the warning signs and sensors, and plowing smack dab into the newly restored structure. When he got out of the truck, he smiled. He has since been cited for reckless driving and destruction of property. The covered bridge is considered a total loss. Three-Bridge Solution in Saxony- The battle between preservation and progress got a bit hairier and went way over the top with this story: A stone arch bridge had to be rebuilt elsewhere, moved aside for a modern bridge. Unfortunately, as you can see in the video, things went south in a hurry. Watch and find out what happened and why we have three bridges instead of one. The story is in the documentary Voss & Team and starts in the 11th minute. Blackfriars Street Bridge- This year’s awards are the year of the bowstring arch bridge for there were some great examples of restored bridges of this kind that have been reported. While the Paper Mill Bridge won the Ammann Awards in two categories, the Author’s Choice goes directly to the Blackfriars Street Bridge because of the painstaking task of dismantling, sandblasting and repairing (in some cases replacing) and reassembling the structure back into place. All within 18 months time, keeping the historic integrity in mind and the fact that the bridge still holds the world’s record for longest of its kind. This is one that will be discussed in the historic bridge community for years to come and one that deserves some kind of recognition of sorts. A pair of bridges visited during my US trip definitely deserve some recognition for its work. The Broadway Avenue Bridge in St. Peter, Minnesota is one of them. 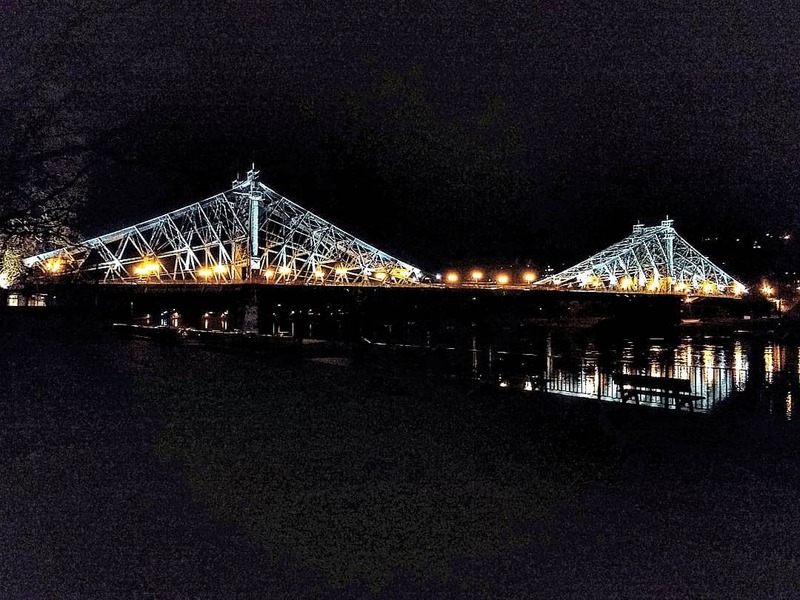 The 1930s two-span through truss bridge underwent a makeover in 2017 with new decking and lighting, fixing some truss parts and a new coat of paint. The forest green colored bridge looks like it was newly built. It’s definitely one for the ages. The other bridge worth noting is the State Street Bridge in Bridgeport, Michigan. The 112-year old two-span Pratt through truss bridge was restored in 2016 where the trusses were taken apart, sandblasted and painted. Some of the truss parts were bent and needed to be straightened. A new pier and new decking followed. The bridge is now one of the key components of the county historical museum, where a collection of historic houses and a park line up along Main Street, adjacent to the Cass River crossing. 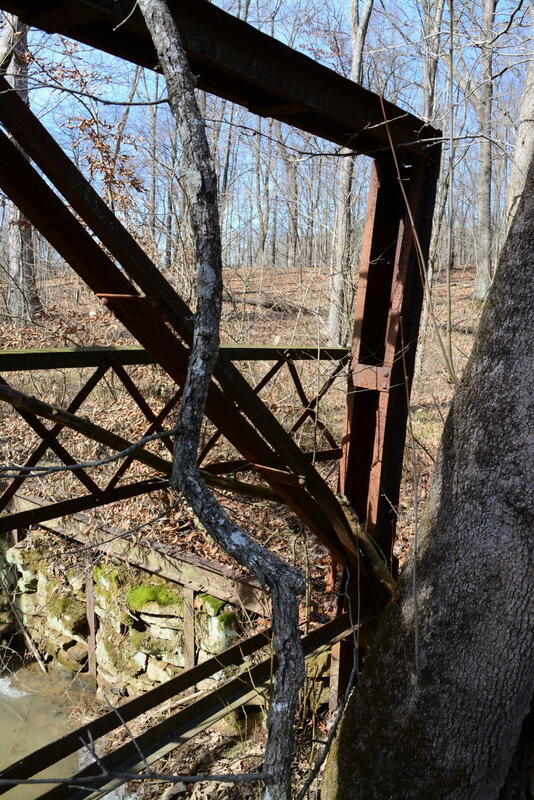 The Bridges of White County, Illinois- Fellow Bridgehunter Melissa Brand-Welch found a collection of abandoned truss bridges in this southeastern Illinois county, each of which had its unique design and history. 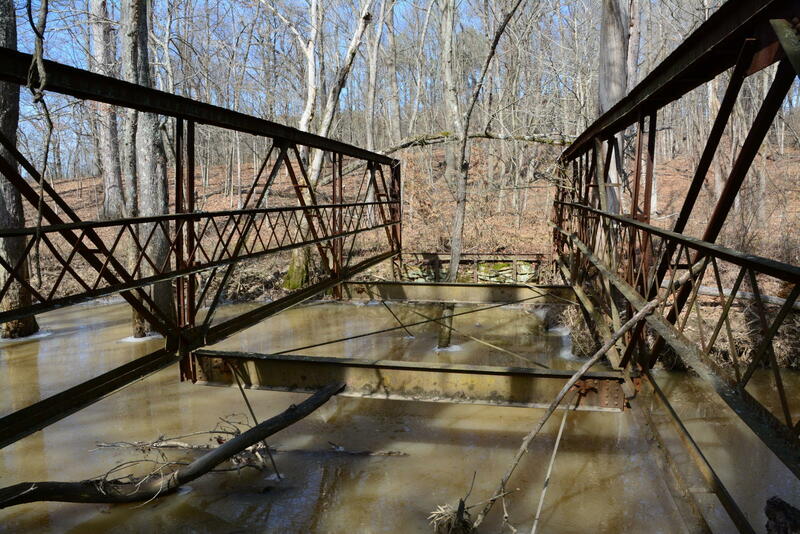 There are at least six through truss bridges and numerous pony trusses that one can find here. Each of them have potential to be restored and reused as a bike/pedestrian crossing. This county got second place in the category of Tour Guide for American Bridges in the 2018 Ammann Awards, while Ms. Brand-Welch won in the Best Bridge Photo category with her oblique photo of the Siglar Bridge. Winning the Author’s Choice Awards in this category should be the third and most convincing reason for county officials to act to collaborate on saving these precious structures. If not, then Ms. Brand-Welch has at least three accolades in her name. Camelback Girder Bridge in Wakefield, Michigan- Runner-up is this small crossing. 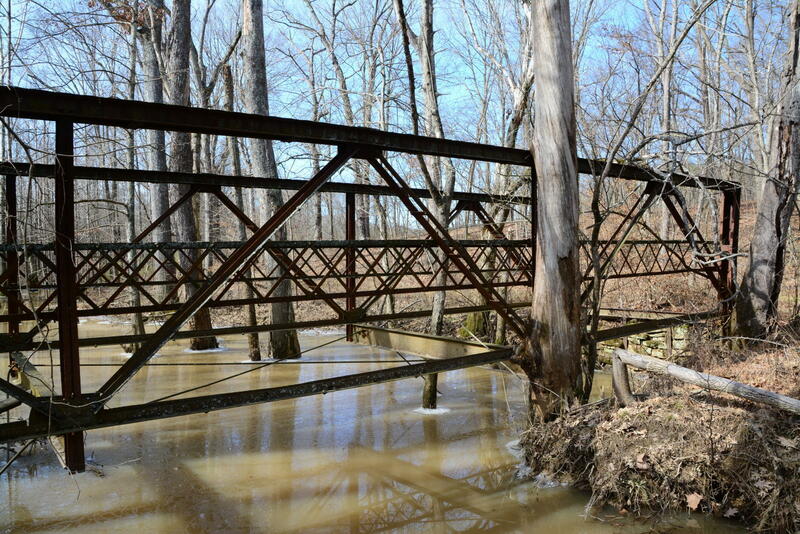 Michigan is famous for its camelback girder bridges of concrete, for dozens were built between 1910 and 1925. This bridge, located 500 feet away from a park in Wakefield, is easy to miss unless the oversized chair next to the shelter catches you. Then during your stop for a photo and picnic, you will see it. May be a boring concrete structure to some, but it is unique enough for a brief stop. Höpfenbrücke in Pausa-Mühltropf (Vogtland), Germany- Located just off a major highway, 15 kilometers west of Plauen in Saxony, this bridge was built in 1396 and was an example of a typical house bridge- a bridge with houses either on the structure or in this case, on the abutments. This structure was restored recently after flood damage forced its closure. The bridge is definitely worth the stop as it is one of three key points the village has to offer. The other two are the palace and the city center, where the bridge is located in. Pul Doba Suspension Bridge- One of the fellow readers wanted some information about this bridge. It is one of a half dozen in India whose towers is shaped like one of the towers of a castle. It was built in 1896 but we don’t know who built it. We do know that this bridge is a beauty. The Bridges of Conwy, Wales- How many bridges does it take to get to a castle? Three, according to the city of Conwy in Wales, which has three structures that lead to one of the most popular places in the country: an arch bridge for traffic, a chain suspension bridge for pedestrians and a box through girder with towers for trains. Not bad planning there, especially as they fit the landscape together despite its space issues with the channel and the penninsula. This sums up my picks for 2018. While we will see what 2019 will bring us for historic bridges, we will now take a look at the results of the Ammann Awards, which you can click here. Remember the results include a podcast powered by SoundCloud.